I also updated my list of Bollywood movies on Netflix with two new additions to the catalog. The animated film Motu Patlu: King of Kings is now available for streaming, as is the 2016 Hollywood biographical drama Lion (which is a real tear-jerker). For everything else new on Netflix — Bollywood or not — check Instant Watcher. 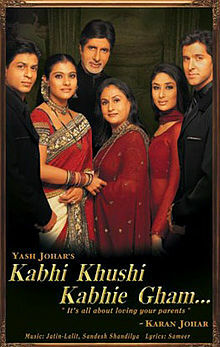 This entry was posted in Streaming Video and tagged Bollywood Movies on Heera, Bollywood Movies on Netflix, Desi Movies on Heera, Desi Movies on Netflix, Hindi Movies on Heera, Hindi Movies on Netflix, Indian Movies on Heera, Indian Movies on Netflix, Ishaqzaade, Kabhi Khushi Kabhie Gham, Khamoshiyan, Lion, Mere Brother Ki Dulhan, Motu Patlu: King of Kings, Rab Ne Bana Di Jodi, Streaming Video on July 9, 2017 by Kathy. One of my favorite parts of Thanksgiving as a kid was the annual “Turkey Day” marathon on Comedy Central, featuring back-to-back episodes of my favorite show: Mystery Science Theater 3000. The marathon’s name referred to not only the traditional Thanksgiving turkey we all dined on, but also to the awful movies — “turkeys” — the guys from MST3K skewered each episode. Though the old Comedy Central event featured lousy films, it got me thinking about how I would organize a Thanksgiving marathon of good Bollywood movies, using only titles available on Netflix. I’ve posted my list below, complete with a fictionalized account of what the day would be like if I were hosting Thanksgiving dinner for my family (which will never happen, BTW). Make sure to limit your movies to those on this Netflix list. This isn’t your ideal Bollywood marathon, just a Netflix marathon. Post your lineup in the comment section below. Happy Turkey Day! This entry was posted in Articles, Streaming Video and tagged Aurangzeb, Bollywood, Bollywood Movies on Netflix, Bollywood-on-Netflix Marathon, Desi Movies on Netflix, Dhoom 2, Hawaizaada, Hindi, Hindi Movies on Netflix, Indian, Indian Movies on Netflix, Kabhi Khushi Kabhie Gham, Kill Dil, Movie, Netflix, Netflix marathon, Streaming Video, Zindagi Na Milegi Dobara on November 25, 2015 by Kathy.